All the control and system information needed by the live engineer is available at the surface. There is a choice of surface size available offering 28, 36, or 44 faders. With 4 layers per bank of faders you get the choice of no fewer than 112, 144 or 176 control strips freely assignable as input channels, mix masters, DCA groups and MIDI controllers. Even the smallest footprint iLive-112 surface has enough capability to handle a fully loaded 64 channel mix. Connections The rear of the iLive surface has a built-in card frame for loading up to 4 I/O modules, a combintation of up to 32 inputs and outputs, for local audio at the surface. The internal PSU module may be supplemented with the rack mount iPS10 supply for redundant backup. 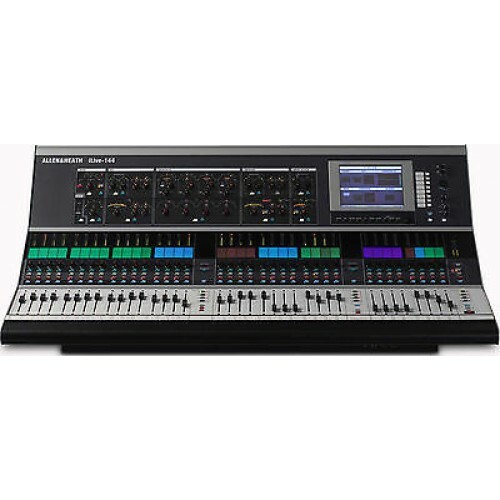 Connections includes local monitor XLR outputs, 1/4" and 3.5mm headphone sockets, XLRs for an analogue PAFL monitor input and talkback connections when EtherSound is not fitted, front and rear USB ports for memory archiving, and an external VGA screen output. You also get a built-in 3-port Ethernet switch, MIDI and PL-Anet. A Digital Board with Analog Feel! 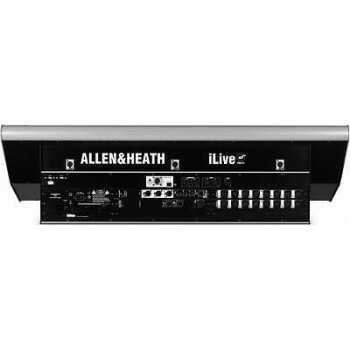 The Allen & Heath iLive digital mixing console system brings the A & H name into the world of live digital mixing. Long a legendary name in the world of analog consoles, the company's foray into digital mixing is characteristically classic and functional. The iLive digital mixing console system combines a powerful digital mix engine with the hands-on, familiar feel of a live console, and the amount of control and peripheral options is incredible. You get the touch of analog and the power and functionality of digital with the Allen & Heath iLive digital mixing console system. The heart of the digital system is the iDR-64, a 19" rackmounting modular mix engine providing 64 channels into 32 mixes, which can be assigned as auxes, groups, matrix and main outputs. The iDR-64 is a stand-alone mixer comprising the 8-channel audio interface cards, DSP processing, and communication ports. The unit is controlled via an Ethernet network and can be connected to a variety of controllers, including Allen & Heath's PL range of remote units, third party devices, or a laptop/PC. The Allen & Heath iLive 80 control surface is designed to reflect the feel of analog and the power and clarity of digital. The iLive 80 has eight local inputs and eight local outputs. The faders are motorized and grouped in three sections, each with four banks. There is a multi-color backlit LCD display above each fader for labeling and color-coding channel information. Channel controls for preamp, filter, gate, EQ, compressor and limiter/de-esser are laid out across the top of the surface on rotary controls with LED indicators, while a color LCD touch screen presents a graphical view of the processing and access to the automation and set up screens.